Your friendly neighborhood Spiderman is back again, in director Sam Raimi's web slinging saga. 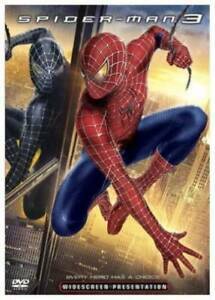 Tobey Maguire, Kirsten Dunst and James Franco return to play their roles from the 2 previous films, along with Thomas Haden Church, Topher Grace, and Bryce Dallas Howard making their first appearances in the series as Flint Marko (Sandman), Eddie Brock (Venom), and Gwen Stacy. Peter Parker has embraced his double life as Spiderman, being with the love of his life (Mary Jane), and the hero the city so desperately needs. But this state of bliss doesn't last long. New villains emerge and new problems confront Peter Parker and Spiderman. Harry gets his father's estate and his flying board and makes a new and powerful Goblin costume. He's out to avenge his father's death and now he's after Spiderman. A mysterious space goop gets on Spiderman's suit and he's amazed by his new found powers. But is this a blessing or curse? Then the same goop infects photographer Eddie Brock and turns him into the fanged villain Venom, Spiderman's most scariest foe. Then Peter discovers that Flint Marko is the one responsible for his uncle's death (Cliff Robertson) and Marko is the dreaded Sandman. With these new villains on the loose - who will protect the citizens of New York City? Will Spiderman be able to fend off these destructive forces and bring calm back to our beloved city? I know he will, he's The Amazing Spiderman. This thrid installment in the series ranks as almost as high as the original in terms of story, character and depth it brings to the story arc. Main characters are ultimately changed and evolved by events that take place in this film. We see old faves like Harry Osbourne interact with new baddies such as Sandman and Venom that really challenge our hero. Peter struggles to maintain the duality of his existence and is pushed into many difficult situations and choices by the mysterious new black suit he finds which increases his power and strength, yet destroys his humanity and slowly takes over his soul. Realizing the dark path he is on, Peter struggles to get control once again even as his circle of enemies close in on him and MJ. Characters and their motivations are questioned, presented and resolved all much deeper and ultimately more satisfying than one would expect in a kids' movie and thus proves the longevity of Spiderman and his universe. This series continues going strong and has many fans eagerly awaiting the new direction the story appears to be going in. Having had a three year break from the second installment in the Spiderman series, Raimi was ready to for the third film. Despite how some people say that this Spiderman film wasn't as good, it grossed second highest attendance within a weeks time after The Dark Knight in 2008. In this film Raimi chose to go back to parts of the first film that could be used for new material, such as adding in a second character to the robbery at the wrestling meet. All the usual suspects are back, Mcguire, Dunst, Franco and Rosemarry Harris. Brand new to the series is the legendary villian from outer space, Venom(played by Topher Grace when not attached to Spiderman) and the Sandman played by Thomas Hayden Church, who most likely steped a little bit out of his style of acting to portray a man who is pushed to becoming a criminal who has the weight of the world on his shoudlers. Both Tobey and Thomas give off a chemistry that is very believable to the audeince at the climax of the film. Too Many Villans For One Movie! I loved the first 2 because they focused on one nemesis for Spiderman to deal with. They developed the rivalry between Spidey and The Green Goblin in part 1. They developed a great rivalry between Spidey and Doc Oc in part 2. Trying to put The Sandman and Venom in one movie seemed like overkill. The Sandman is a legendary enemy to Spiderman in the comics, but nothing compared to the fued between Venom (the new host of the alien symbiote) and Spiderman. Topher Grace is a wimpy Eddie Brock to begin with. Thomas Hayden Church was OK as Sandman, but wooden all the way. The plot twist involving the Sandman and Uncle Ben was a dumb idea to write into the movie. With "The New Goblin", "Sandman", and "Venom" in the same movie there was just no time to focus on Venom. A MOVIE THAT PITTED VENOM VS. SPIDEY WOULD HAVE BEEN JUST FINE! Part 3 had to have 3 major villans while the first 2 movies had one major villan, and for a reason...CHARACTER DEVELOPMENT! MY MAJOR COMPLAINT IS THAT SPIDERMAN'S MASK WAS OFF ALL THE FREAKIN' TIME! Harry's mask was always off too! They hardly had the Venom face on Topher either. All you see is Tobey Macguire's face with a Spiderman costume on. I SEEN THIS OPENING SHOWING AT 12AM...AND NOBODY CLAPPED AT THE END OF THE MOVIE! THEY WERE SICK OF SEEING TOBEY MACGUIRE'S FACE INSTEAD OF HIS MASK! One Word -- AWESOME !!!!!!! !